So in light of those charges it came as no surprise when, in August, Driscoll began an extended leave of absence from the church. And it was hardly shocking when Mars Hill revealed weeks later that a precipitous drop in membership and donations would force it to cut staff by 30 to 40 percent and shutter a handful of its 15 branches. What is surprising, though, at least in retrospect, is how Driscoll grew to such prominence in Seattle. Recently John MacArthur commented on how the crass Mark Driscoll has paved the way for Evangelicals to embrace the equally crass Donald Trump. 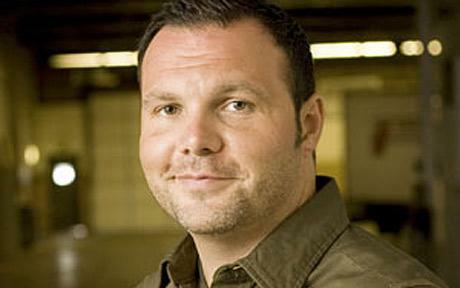 In December 2011 Mark Driscoll was interviewed by Justin Brierley, Christian host of a podcast called “Unbelievable” produced in the UK. Driscoll was, as usual, fractious. He made light of Christianity in the UK and at one point challenged Brierley to name him one good, young celebrity Christian preacher in the UK. You can listen to the whole interview here. Needless to say, Driscoll’s comments were not well received in the UK. Below is an audio taken from a YouTube video produced by Stephen Holland, a preacher in the UK. You can listen to his fifteen-minute response here. I have recorded Holland’s closing remarks in the audio below. If you are wondering what visions Mark Driscoll was supposedly receiving from God watch the video below. Below is an audio from the Mortification of Spin podcast of 8-27-2014. 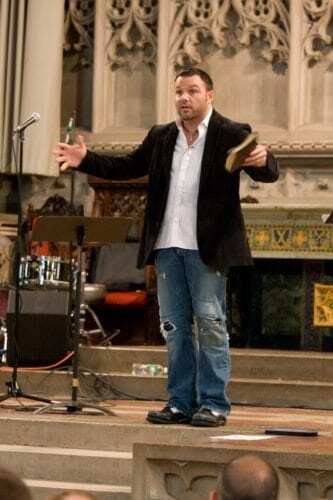 Carl Trueman states that Mark Driscoll was pulling a scam at Mars Hill church in Seattle. I submit that nothing has changed with Driscoll. In the audio below Todd Pruitt, from a Mortification of Spin podcast entitled “Bully in the Pulpit,” speaks out against just the type of leadership that Mark Driscoll has established at his new church. 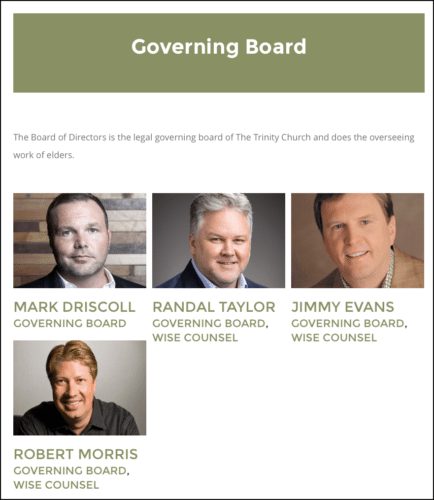 I challenge those of you attending Driscoll’s newest church in Scottsdale, AZ to ask Mark Driscoll how often the Trinity Church of Scottsdale’s Governing Board meets. Ask him for minutes from their last meeting. You will never see any minutes. In my opinion these men are all frauds; their luxurious lifestyles are financed by the the willing celebrity worshippers sitting in their pews, foolishly handing their hard earned cash over to these charlatans. They are just like Washington politicians voting themselves raises, but they do it in the name of God. Finally, below is an audio from October 16, 2014 in which Janet Mefferd interviews Warren Throckmorton shortly after Mark Driscoll resigned from Mars Hill Church. Phoenix residents – do you really want to get involved in a church led by Mark Driscoll? Don’t repeat Seattle’s mistake! Gospel Centered Plagiarism-Further Evidence of the Demise of the T4G – 9Marks – Gospel Coalition Crowd? I don’t know most of Driscoll’s “wise” counsel, but I do know of Robert Morris and he’s another of the celebrity, health/wealth guys who is building a giant fiefdom here in N Texas. I also have heard a few if his sermons and he has got to be one of the poorest excuses of sound exegesis I’ve heard in quite some time. He’s a close second to Joel Osteen. Thanks for the comment. 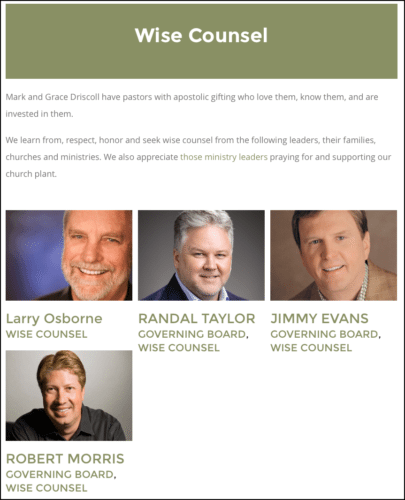 I don’t know much about any of Mark Driscoll’s wise counselors. I have seen one video of Robert Morris welcoming Driscoll to his conference and it was all I could handle. Morris told his audience that the way he sees it we have only two choices. 1)We could crucify him. 2) We could gently and lovingly restore him. The way I see it Morris is overlooking a third, and in my opinion the correct choice; Driscoll should be encouraged to repent to all those he has treated so harshly, he should repay the funds he fraudently used in the scam to promote his book to the NY Times best seller list, he should be encouraged to attend a church with sound teaching and lastly he should be permanently removed from the pastorate. After all, he does not meet the biblical qualifications of an elder. Robert Morris demonstrates a very disturbing lack of comprehension of the Bible and a serious lack of wisdom when he seeks to restore Mark Driscoll to ministry. It is unfortunate Morris is teaching those in his conference audience that behavior like Driscoll has displayed does not disqualify one from the ministry. A little story I like to use to open people’s eyes to the scandal of this actually occurred at United Christian Church of Dubai. The business manager stole a large amount of money from the church – he was paying it back slowly, but his conscience convicted him and he confessed his sin to the church pastors. (They were totally unaware of the theft.) We all forgave him (at least most of us did) and he was lovingly restored to fellowship. This did not, however, include restoring him to his position as business manager. (He had been immediately removed from his position.) I think the church did the right thing. Just as you do not restore a man who has demonstrated he is unfit to handle the church’s funds honestly to a position of once again handling the church’s money; so it should be with a pastor like Mark Driscoll. He has demonstrated he is not qualified for the position. Forgive him and restore him to fellowship, but never should he be pastoring a church again. He needs to find a different occupation. Based on the fact that Driscoll cannot stand to be out of the limelight is a good indicator that he has not seriously repented. Here is the Morris/Driscoll video. Warning – do not view immediately after eating! Great comment, Todd. I believe that if Mark Driscoll was serious about his self-professed orthodox Christian beliefs, he would understand that he is no longer qualified to be a spiritual leader of any kind, much less be the Sr. Pastor of a large Church. The Bible says that an elder must generally be “above repute” and he’s pretty far from meeting that standard right now. It then follows that, according go my logic, no one can take any apologies Mr. Driscoll makes seriously until he acknowledges his moral obligation to leave the “celebrity Pastor” business he’s been in, for many years, behind, and seek a lower-profile and less controversial form of employment at this time. Also, many folks seem focused on trying to get/hoping that Mr. Driscoll will repent. While I hope he reforms his life and resolves the IRS inquiry into his alleged (very credibly) mis-use of non-profit Church funds at his former Church, the state of his soul is not my primary concern. Instead, I want to warn others to stay away from a man whom I believe to be a garden-variety con artist masquerading as a Christian leader. To me, that does not constitute crucifying anyone; it’s just an expression of common decency/common sense that Mr. Driscoll’s apologists seem to be lacking. Lastly, I am happy that the Church in Dubai handled a difficult situation involving a serious breach of trust involving mis-managed funds with intelligence and compassion. Thanks for sharing that story, Todd! Thanks for the link mirele and keep up the good work. Like someone said, here’s Mark’s new bus, same as the old bus. Channel 12 here in Phoenix took a lot of information from the KING5 Seattle, added their own information, interviewed Janet Mefferd and even included a clip of me picketing and ran it today. It’s pretty damning. I saw that story and Tweeted it. Great job Deana. Your faithful picketing is paying dividends. Thanks again for your ongoing efforts. I wonder why Driscoll refuses to speak to the press? I thought there was no such thing as bad publicity! I’m going to say it’s because Driscoll has overtly moved over from running a church to running a cult. I know that’s not a popular thing to say, especially when someone like Driscoll allegedly preaches orthodox doctrine (altho’ that’s disputable). But I came to that conclusion after (a) what happened to you when you went in to watch Driscoll’s show in July and (b) seeing the way “church security” treated Josh Green (KING Seattle reporter) when the guy refused to take Green’s business card. It was total Scientology non-confront behavior. You would think Driscoll would have taken advantage of free time on TV in one of the largest cities in the USA to at least get out the word that it’s all about Jesus. Or is it? Thanks for all you do, Mirele. In my experience, if you have to wonder if you’re in a cult you’re almost certainly in one. 😉 Also, there’s such a disjoint between what Mark Driscoll preaches and the way he lives his life that there’s no reason to assume that he really believes his official positions about doctrine and theology, in my view. In other words, I think some folks are wrong/naive to consider someone a Christian with orthodox views just because he/she claims to fall into that category of religious beliefs. Hey Buddy!, I found this information for you: "Do You Really Want Mark Driscoll to be Your Leader?". Here is the website link: https://thouarttheman.org/2016/08/10/4576/. Thank you.